"To avoid any restriction on a horse's natural harmony and grace, but rather to encourage its suppleness and sheer pleasure in its own movements" is the ultimate aim of Rudolf Zeilinger, one of the most talented pupils of the late Willi Schultheis, and himself a trainer of Olympic and World Championship horses. Rudolf Zeilinger is well-known for the gentle and sensitive way he trains dressage horses, encouraging them to develop a relaxed, confident, and athletic way of going, combined with a happy, forward-thinking attitude in their work. 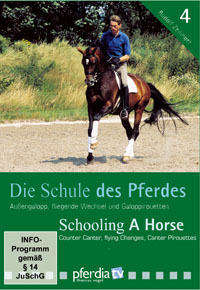 The counter canter and flying changes are the main focus in Part 4 of Zeilinger's DVD series Schooling a Horse. The extremely successful dressage trainer once again affords us the opportunity to see how he works with his horses. Learning flying changes, for example, is difficult for many horses. Zeilinger realistically shows us how even that initially struggle with this lesson can eventually learn it without experiencing stress in the process. Canter work up to the level of half passes, canter pirouettes, and tempi changes is included.